Thanks to some stiff breeze, the last two boats to cross the finish line of the Cruising Yacht Club of Australia’s 2018 Rolex Sydney Hobart Yacht Race have arrived well in time to see in the New Year. 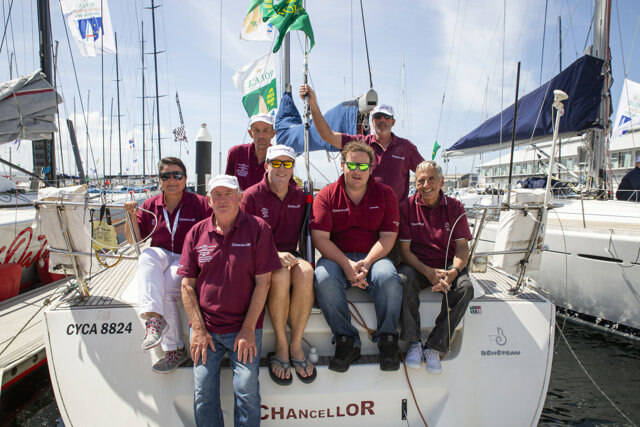 Gun Runner and Chancellor were vying for the ‘last to finish’ title and the Army Sailing Club’s 9.2-metre Jarkan 925, skippered by Reece Young, made a late run to overtake Chancellor and skated in shortly after midnight in 78th place, while Ted Tooher’s Chancellor finished just before 1.30am. Gun Runner was the smallest in the 85-boat fleet this year. There are only six aboard and apart from Young and crew member Murray Stewart, who had done one Sydney Hobart each, the crew were new to the race. In total, five of the crew are in the Army and one in the Navy. Young is proud of their achievement: “This the culmination of the year’s work. We spend it taking 200 soldiers out on the yacht, teaching them to sail and taking them offshore. We spend 70 to 75 days offshore,” he said. “It was a fantastic race. We got a wide variety of conditions. It was northerly at the start and enough strength in it to stay on rhumbline. “Saturday was the best – gale-force winds – consistent 35 knots to over 50 knots. We were sailing close hauled – the wind whipping water into our faces. It felt like hail hitting you. We had three-metre waves, so were reefed down with a No. 3 headsail doing 8.9 knots, faster than the boat should go. And this is when they overtook Chancellor. “Sunday the wind dropped away to 5-10 knots from the south-east. Running down the coast, it dropped down to 3-4 knots. The whole day we were sailing under 4 knots and thought we wouldn’t make it to the finish before midnight and get stuck. But we turned at Tasman Island and Murray (Stewart) took over steering while I was off watch. It meant no big wind shutdown for them and Gun Runner finished fourth in Division 4, and best of all, won the Corinthian division. “The guys all loved it – it’s a great adventure – a challenge. The most novice of the crew, Clark Smith, didn’t get seasick, so he did the navigation,” Young finished. On a tiny boat, tasteless ration packs are de rigueur, so the crew hit the showers and found a decent meal. Meanwhile Ted Tooher sailed his Beneteau First 47.7 over the finish line in last place, just before 1.30am this morning, bringing the Rolex Sydney Hobart Yacht Race to an end. Chancellor also finished last overall, but that does not matter to Tooher and his crew. “I like to make as even as split of men and women (four women this year) that I can and first timers (there were six) to give them the opportunity of doing this great race,” the Sydney skipper said. Chancellor had their share of difficulties too, which slowed her down. “We broke the spinnaker pole early on and had to cobble it together with liquid nails – it took a while and it was shorter, but it got us back in the race,” Tooher said. It didn’t end there. “Later in the race we heard a huge thump and a shark or small whale flew up in the air right at the bow. It gave us a huge shock, especially the bowman who was up there at the time,” Tooher recalled. Jim Nixon, a long-time crew member of Shane Kearns on Komatsu Azzurro, told of their most frustrating moment on the S&S 39: “At Tasman Island the boats in front of us were doing 9 knots and the boats behind us were doing 9 knots and we had nothing!. What Nixon didn’t mention was he had just finished his milestone 25th Sydney Hobart, for which he will receive a special medallion at the official prize giving today. “We had a great race,” Shane Kearns said. “We stepped off the dock (in Sydney) and knew we’d done everything we could to have a good race. “This was Jim’s 25th race, so we gave him the helm three hours out from the finish, then we all worked hard to and beat Mark Twain for him, but they got us by two minutes (overall),” said Kearns who finished 53rd, while Mark Twain was 52nd. Everyone had a tale to tell and so ends the 2018 Rolex Sydney Hobart Yacht Race.